Reading did not enjoy the best preparation for next week's FA Cup semi-final as they drew against Blackburn at the Madejski Stadium. Looking for their first Championship win in five matches before their trip to Wembley to face Arsenal, Reading had the better of the first half. Substitute Hope Akpan almost won the game for Reading with a header from a corner that was bundled off the line. Jem Karacan made his first start for Reading in 16 months after injury. 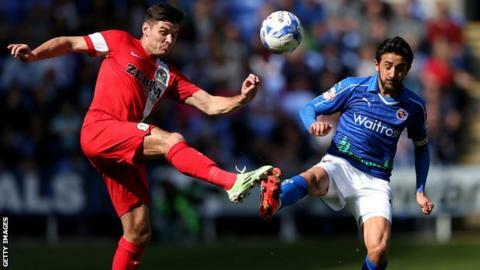 The closest Blackburn, beaten by Liverpool in mid-week in the FA Cup as they missed out on a semi-final against Aston Villa, came to making the breakthrough was a cross from Ben Marshall that goalkeeper Adam Federici was forced to push over. Hal Robson-Kanu also went close for Reading, who enter Wembley next week with just two wins from their last 11 league games. Reading host leaders Bournemouth on Tuesday in their last game before going to Wembley next Saturday. "We're now three games unbeaten, with three draws. We'd much rather there was a win in there but we're proving a little bit more difficult to beat now. We certainly want to continue that against Bournemouth. "There's a fantastic excitement around the club but, for us, the next game is Tuesday night. We have to focus on that first. "Today, I was pleased with the team. It's the first time in a few weeks that I've sat at the side of the pitch and felt that we had control of the game. The only thing that was missing was a goal." "We've got more or less a team missing because of injuries and these players are doing ever so well. "To come away from home and keep a clean sheet is a massive positive. We've still got plenty to play for this season. Our players are honest and they want to improve. "People now judge your character. The end of the season tests your mental strength and our players showed that today." Match ends, Reading 0, Blackburn Rovers 0. Second Half ends, Reading 0, Blackburn Rovers 0. Corner, Reading. Conceded by Ben Marshall. Attempt blocked. Hope Akpan (Reading) header from the centre of the box is blocked. Assisted by Oliver Norwood with a cross. Corner, Reading. Conceded by Matthew Kilgallon. Attempt blocked. Jamie Mackie (Reading) left footed shot from the right side of the box is blocked. Assisted by Oliver Norwood. Attempt missed. Lee Williamson (Blackburn Rovers) right footed shot from the centre of the box is close, but misses to the left. Assisted by Jordan Rhodes. Hal Robson-Kanu (Reading) is shown the yellow card. Offside, Reading. Nathaniel Chalobah tries a through ball, but Kwesi Appiah is caught offside. Attempt missed. Hope Akpan (Reading) left footed shot from outside the box misses to the right following a corner. Corner, Reading. Conceded by Adam Henley. Foul by Hope Akpan (Reading). Ben Marshall (Blackburn Rovers) wins a free kick on the right wing. Substitution, Reading. Hope Akpan replaces Garath McCleary. Substitution, Reading. Kwesi Appiah replaces Pavel Pogrebnyak. Lee Williamson (Blackburn Rovers) is shown the yellow card for a bad foul. Hal Robson-Kanu (Reading) wins a free kick in the defensive half. Attempt missed. Pavel Pogrebnyak (Reading) header from the centre of the box misses to the left. Assisted by Chris Gunter with a cross. Corner, Reading. Conceded by Thomas Spurr. Foul by Hal Robson-Kanu (Reading). Lee Williamson (Blackburn Rovers) wins a free kick in the defensive half. Pavel Pogrebnyak (Reading) wins a free kick on the left wing. Foul by Chris Brown (Blackburn Rovers). Substitution, Reading. Oliver Norwood replaces Jem Karacan. Foul by Alex Pearce (Reading). Jordan Rhodes (Blackburn Rovers) wins a free kick on the right wing. Substitution, Blackburn Rovers. Paul Taylor replaces Tom Cairney. Delay in match Garath McCleary (Reading) because of an injury. Corner, Blackburn Rovers. Conceded by Adam Federici. Foul by Nathan Aké (Reading). Jordan Rhodes (Blackburn Rovers) wins a free kick in the defensive half. Pavel Pogrebnyak (Reading) wins a free kick in the defensive half. Foul by Ben Marshall (Blackburn Rovers).